REGISTERED USERS: For Sprinkler Times subscribers who have previously purchased the app. 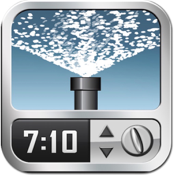 The FREE Sprinkler Times app allows subscribers access to their custom schedule across multiple platforms (smartphone and computer). NEW SUBSCRIBERS: Please download and purchase the full version of Sprinkler Times to open a new account. Do not download this version of Sprinkler Times.